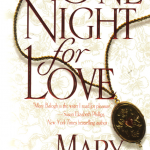 Note that Neville, the Earl of Kilbourne’s story is told in One Night for Love. Gwen, Lady Muir, Neville’s sister and Lauren’s best friend, has her story told in The Proposal, which is also the first book of the seven-part Survivors’ Club series. 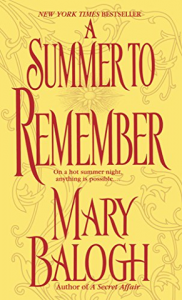 Note too that A Summer to Remember introduces the Bedwyn family and leads to the six-part Slightlyseries and the four-part Simply series. This is the opening scene of the book. Notice that the Duchess of Portfrey and her niece are mentioned briefly. The niece is Lauren Edgeworth, a sheltered and proper young lady. Very shockingly, she both sees and hears Kit—as yet a stranger to her. London’s Hyde Park was decked out in all the splendor of a May morning. Sunlight beamed down from a clear blue sky and twinkled off a million dewdrops, giving a fresh, newly washed appearance to trees and grass. It was a perfect setting for the customary promenade along fashionable Rotten Row, the riders cantering along the wide stretch of turf that ran from Hyde Park Corner to Queen’s Gate, the pedestrians strolling on the footpath beside it, separated from the equestrians by a sturdy rail. Perfect except for one discordant detail. In the middle of an open stretch of grass well within sight of the Row some sort of commotion was rapidly drawing a crowd of the curious. That it was a fight quickly became evident. Not a duel—there were four participants instead of two and the morning was far too well advanced—but an indecorous outbreak of fisticuffs. Gentlemen, and a few ladies too, rode closer to see what was transpiring. Many of the gentlemen stayed to watch the progress of the fight, their interest in the morning considerably piqued. A few, those unfortunate enough to be escorting ladies, were obliged to ride hastily onward since it was most certainly not a genteel sight for female eyes. Some pedestrians too approached the scene along the path that ran close by and either hurried on past or drew closer, depending largely upon their gender. But although the shabby garments and generally grubby, unkempt appearance of three of the participants in the fight proclaimed them to be undoubtedly of the very lowest classes, the elegant though scant clothing and general bearing of the fourth told an entirely different story..
“It is Ravensberg, sir,” the Honorable Mr. Charles Rush explained to the outraged Marquess of Burleigh. The name was apparently explanation enough. The marquess raised a quizzing glass to his eye and from the vantage point of his position on horseback peered through it over the heads of those on foot at Viscount Ravensberg, who was stripped to the waist and at that particular moment was having much the worst of the encounter. He had an assailant clamped on each arm while the third pummeled him with hearty enthusiasm in the stomach. “Ravensberg challenged riffraff?” the marquess asked with considerable disdain. This exclamation was occasioned by Lord Ravensberg’s response to the punch in the eye. He laughed, an incongruously merry sound, and suddenly lashed out neatly with one slim leg and caught his unwary assailant beneath the chin with the toe of his boot. There was a loud cracking of bone and clacking of teeth. At the same moment he took advantage of the astonishment of the two who held his arms and twisted free of them. He spun around to face them in a half crouch, his arms outstretched, his fingers beckoning. He was grinning. The opponent whose jaw had just been shattered might have thought so. But although his eyes were open, he appeared more intent upon counting stars wheeling in the morning sky than considering odds. There was a roar of appreciation from the ever growing crowd of spectators. Viscunt Ravensberg showed to far better advantage without his shirt than with it. A gentleman of medium height and slender grace, he had doubtless appeared an easy mark to the three thugs who had taken him on with a collective smirk of insolent contempt a few minutes before. But the slim legs, encased in fashionable buff riding breeches and top boots, showed themselves to be impressively well muscled now that he had descended from the saddle. And his naked chest, shoulders, and arms were those of a man who had exercised and honed his body to its fullest potential. The white seams of numerous scars on his forearms and chest and one the length of the underside of his jaw on the left side proclaimed the fact, as his clothes did not, that at one time he had been a military man. But no one, not even Mr. Rush, to whom his remarks were addressed, was paying him any attention. Two of the bullies who had thought to amuse themselves by coaxing unwilling kisses from an unaccompanied milkmaid in the park were taking turns rushing at the viscount, who was laughing and repulsing them with his jabbing fists every time they came within range. Those who knew him were well aware that he spent a few hours of most days at Jackson’s boxing saloon sparring with partners far his superior in height and weight. But although one gentleman detached himself hastily—and perhaps reluctantly—from the crowd at mention of the duchess’s name, his lordship’s disapproving voice was largely drowned out by a roar of enthusiasm as the viscount’s remaining two assailants took his advice and charged him in tandem, only to find their progress checked when he reached out his arms and cracked their heads together. They went down as if their four legs had turned to jelly, and they remained down. “Bravo, Ravensberg!” someone called above the chorus of whistles and cheers. “‘E’s bloomin’ broke my jaw, ‘e ‘as,” the third young man complained, clutching it with both hands and turning over on the grass to spit blood and at least one tooth onto the grass. He had abandoned counting stars but did not look as if he were about to resume the fight. But the morning had one more incident of interest to offer—both for him and for the cheering spectators. The milkmaid who had been the unwitting cause of the fracas came hurtling across the grass toward him—the crowd parted obligingly to let her through—flung her arms about his neck, and pressed her person against his. She was plump and shapely and ruddily pretty and drew shrill whistles and admiring, bawdy comments from the spectators. Viscount Ravensberg grinned at her before dipping his head and availing himself of her offer with lingering thoroughness. He tossed her a half sovereign along with a wink from his good eye when he was finished, and assured her that she was indeed a good girl. There were more whistles as she made her unhurried departure, all dimples and saucily swaying hips. He looked about him after taking it from the hand of Lord Farrington, to whom his clothes had been entrusted at the start of the fight. The crowd was dispersing. He raised his eyebrows. “Frightened all the ladies away, did I?” He squinted off in the direction of Rotten Row as if searching for one in particular. The viscount laughed and swung himself up into the saddle of his horse, whose bridle Mr. Rush had been holding. A few minutes later Hyde Park in the vicinity of Rotten Row was its usual elegant, tonnish self, all traces of the scandalous brawl vanished. But it was one more incident to add to the lengthy list of wild indiscretions for which Christopher “Kit” Butler, Viscount Ravensberg, had become sadly notorious.